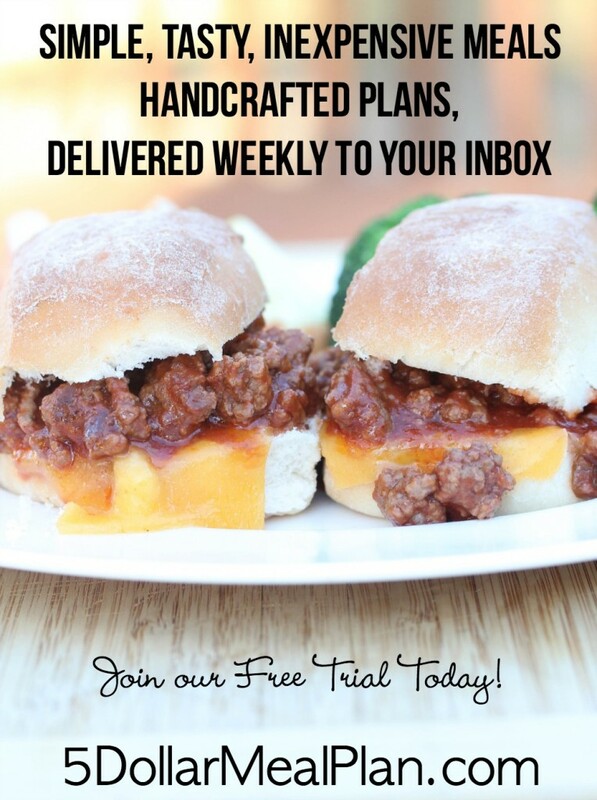 The $5 Meal Plan ~ Weekly Meal Plan Subscription to Save Your Sanity! We all know that meal planning is important, it’s how you save money, waste less food, and stay on budget. But it takes so much time. Even if you enjoy planning each week, wouldn’t you rather spend it with your family? Or doing something you truly enjoy? If so, then I’m really excited to talk to you about something special I’ve been working on – $5 Meal Plan. Get a weekly meal plan and shopping list filled with simple, tasty, inexpensive meals that your family will love. Try it for FREE for 14-days, 100% risk free with no commitment upfront. A subscription is just $5 a month after your free 14-day trial period. We offer annual and semi-annual plans as well where the cost drops to just $4 a month. Each meal plan costs less than a slice of pizza! We offer a free trial so you can decide for yourself, risk free. We also offer a 100% satisfaction guarantee so that if at any time you are unhappy, we’ll refund your membership fee. I have been able to make all of these meals for under or very close to $5 for our entire family! The total cost for the meals for your family will depend on a variety of factors, but you can rest assured that the meal are budget friendly and ‘$5 Dinner Mom Approved’! Also, we have a secret Facebook group where our users discuss how much they spend on the ingredients in the plan each week! I signed up last month and paid the entire year membership price. I received emails for three weeks but did not receive one this week. When I tried to manually sign in on the website it said it did not recognize my email address. Could you help with this issue? Has this been resolved? Have you joined the Facebook Group for this site? It was resolved via email, thanks! Please email [email protected] for help! Do these meal plans require coupons to get the price mentioned per plan? No, coupons are not necessary to get to the advertised price point of about $2-3 per person per meal. Although, many readers are able to lower their meal price even more. The name $5 meal plan comes from the fact that the subscription service is $5/month to receive a detailed meal plan each week with full shopping lists and recipes including 5 dinners, breakfast, dessert, side dish, snack etc. Hi, I have a question do we get to pick or look at menu options? I have 2 picky eaters daughter and HUSBAND!!!!! My options are always hard to transform the same meals to different things and I’m dying. I end up making their dinner and incorporate whatever meat I cook for them in to my meal. The one thing I’ve been able to add to cooking is almond milk & more olive oil since they are not in kitchen when cooking. I asked my husband the other day why he bought regular milk? He said we need it in the noodles I just bought. I was like no, I’ve been using almond milk every time I’ve been cooking them. See no difference- he just kinda looked bewildered and walked off. They love cucumber’s and carrots not cooked, corn on cob or out of can cooked but that’s bout as far as I get them. Please please please help. Desperate to eat different things and expand most importantly my daughters Palit.